For his second Farmer Series dinner of 2011, Chef Alan Wong debuted Kuahiwi Ranch’s British White beef. 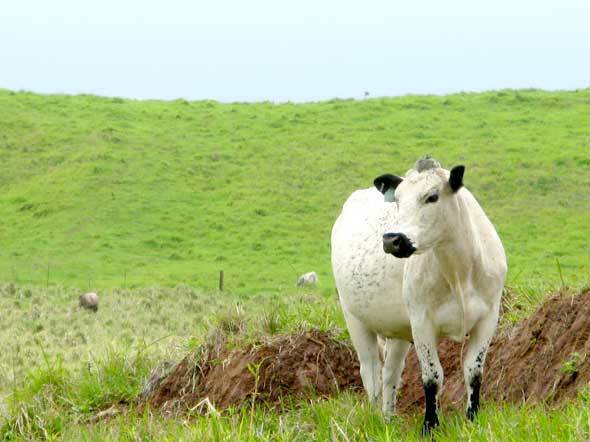 Distinguished, hardy and marked as a true heritage breed, British White are an ancient breed of cattle whose origins are speculated to go as far back as the Roman Empire. In 1940, under the threat of heavy bombing and fear of invasion by German forces during World War II, arrangements sought to preserve this special breed by finding sanctuary for select group of them in the American Midwest. Sami is a creative thinker. She’s been researching the various breeds, looking for ones that can thrive on grass foraging, specifically the grass on their 10,000 acre ranch. To remain viable in this industry, they will need to raise their cattle on grass and market them in Hawaii. Her hard work proved successful, the British Whites are a perfect match. You can also find her at the KCC Farmers Market every second weekend of the month. We’ll send an update your way too once we hear who’s serving and selling! Missed the first post about Michelle Galimba and her family’s ranch? Go here.